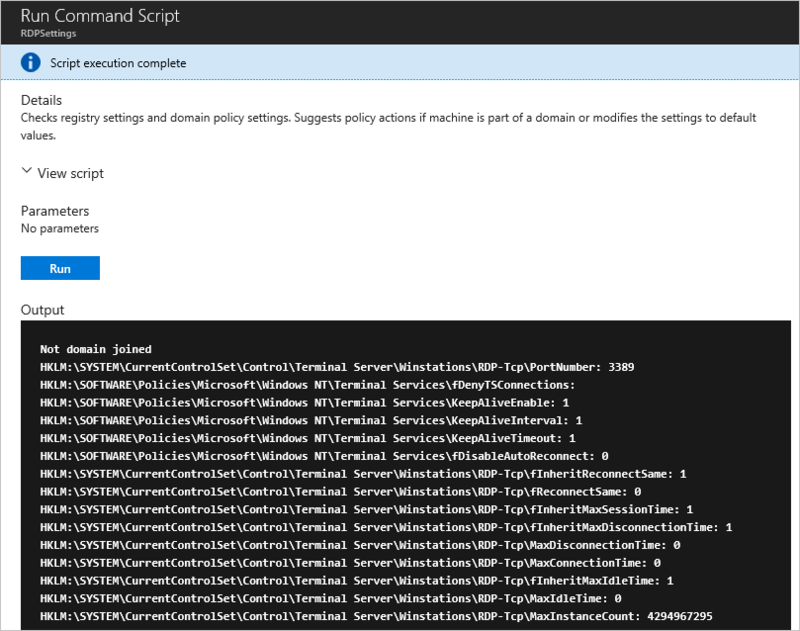 Run Command uses the VM agent to run PowerShell scripts within an Azure Windows VM. These scripts can be used for general machine or application management, and can be used to quickly diagnose and remediate VM access and network issues and get the VM back to a good state. There are multiple options that can be used to access your virtual machines. Run Command can run scripts on your virtual machines remotely using the VM agent. Run Command can be used through the Azure portal, REST API, or PowerShell for Windows VMs. This capability is useful in all scenarios where you want to run a script within a virtual machines, and is one of the only ways to troubleshoot and remediate a virtual machine that doesn't have the RDP or SSH port open due to improper network or administrative user configuration. Scripts that prompt for information (interactive mode) are not supported. Outbound connectivity from the VM is required to return the results of the script. To function correctly, the Run Command requires connectivity (port 443) to Azure public IP addresses. If the extension doesn't have access to these endpoints, the scripts may run successfully but not return the results. If you are blocking traffic on the virtual machine, you can use service tags to allow traffic to Azure public IP addresses by using the AzureCloud tag. Navigate to a VM in Azure and select Run command under OPERATIONS. You are presented with a list of the available commands to run on the VM. Choose a command to run. Some of the commands may have optional or required input parameters. For those commands the parameters are presented as text fields for you to provide the input values. For each command you can view the script that is being run by expanding View script. RunPowerShellScript is different from the other commands as it allows you to provide your own custom script. The built-in commands are not editable. Once the command is chosen, click Run to run the script. The script runs and when complete, returns the output and any errors in the output window. The following screenshot shows an example output from running the RDPSettings command. This table shows the list of commands available for Windows VMs. The RunPowerShellScript command can be used to run any custom script you want. EnableRemotePS Configures the machine to enable remote PowerShell. EnableAdminAccount Checks if the local Administrator account is disabled, and if so enables it. IPConfig Shows detailed information for the IP address, subnet mask and default gateway for each adapter bound to TCP/IP. RDPSettings Checks registry settings and domain policy settings. Suggests policy actions if machine is part of a domain or modifies the settings to default values. ResetRDPCert Removes the SSL certificate tied to the RDP listener and restores the RDP listerner security to default. Use this script if you see any issues with the certificate. SetRDPPort Sets the default or user specified port number for Remote Desktop connections. Enables firewall rule for inbound access to the port. The following is an example using the Invoke-AzVMRunCommand cmdlet to run a PowerShell script on an Azure VM. The cmdlet expects the script referenced in the -ScriptPath parameter to be local to where the cmdlet is being run. Listing the run commands or showing the details of a command require the Microsoft.Compute/locations/runCommands/read permission, which the built-in Reader role and higher have. Running a command requires the Microsoft.Compute/virtualMachines/runCommand/action permission, which the Virtual Machine Contributor role and higher have. You can use one of the built-in roles or create a custom role to use Run Command. See, Run scripts in your Windows VM to learn about other ways to run scripts and commands remotely in your VM.